A new page has been added to The Monkees Live Almanac website, chronicling The Monkees' appearance at the Pantages Theatre in Los Angeles, California this past September, which Michael Nesmith said would be his last with the group. The essay examines Michael's history with The Monkees since the group's revival in 1986 as well as the Pantages concert itself. I'd like to say a big thank you to Sherri Hansen who provided most of the photos you will see on the page (with more on the way to be added at a later date). A shout-out as well to Elliott Marx, who shared his wonderful audience recording of the show on SoundCloud, and to all the fans who uploaded their video footage to YouTube. Please enjoy - and I welcome any feedback. Sandra Schock recently shared some of her Monkees artwork with the Live Almanac. Here's a sketch of The Monkees inspired by their September 2016 performance at the Pantages Theatre in Los Angeles. For more of Sandra's artwork, be sure to visit her on Facebook and Twitter, and stay tuned to the Live Almanac for a page devoted exclusively to this show, Michael Nesmith's final performance with The Monkees. Thanks to Brian Sumner for filming this historic show, advertised as Michael Nesmith's final concert with The Monkees, and to Sherri Hansen for creating a playlist of the footage on YouTube. Enjoy! ​On September 16, 2016, a New Monkees fan (me!) made the two hour trek to witness the event of a lifetime, The Monkees’ concert at the Pantages Theatre in Los Angeles. The show had been previously announced as the final performance by Michael Nesmith with the group, on a tour that quite possibly could be their last. So just what was I, a New Monkees fan, doing there, you might ask? I will answer that, but first, a little background. The New Monkees, for those of you unfamiliar with the group, were Marty Ross, Larry Saltis, Dino Kovas, and Jared Chandler. The New Monkees television series was the brainchild of Steve Blauner, a former partner of Monkees producers Bob Rafelson and Bert Schneider, and worked the same way as the original Monkees: the four members were hired to star in a TV series and release music in conjunction with the show. Every member of The New Monkees was an accomplished musician with the exception of Jared, who was a professional actor. The series premiered in syndication in the fall of 1987 (while the reunited Monkees were still riding the wave of their massive 1986 revival). Despite the show lasting only 13 episodes before it was cancelled, the group managed to release an eponymous LP. ​Decades later, The New Monkees reunited in 2007 for a small meet and greet with their fans to celebrate the group's 20th Anniversary. I was lucky enough to attend this event, and as a result, a friendship with the four members flourished. I am currently writing their biography. Now then, what was I doing at a Monkees concert? Well, I found that in writing a book on The New Monkees I needed to better understand the group that in a sense gave birth to them. 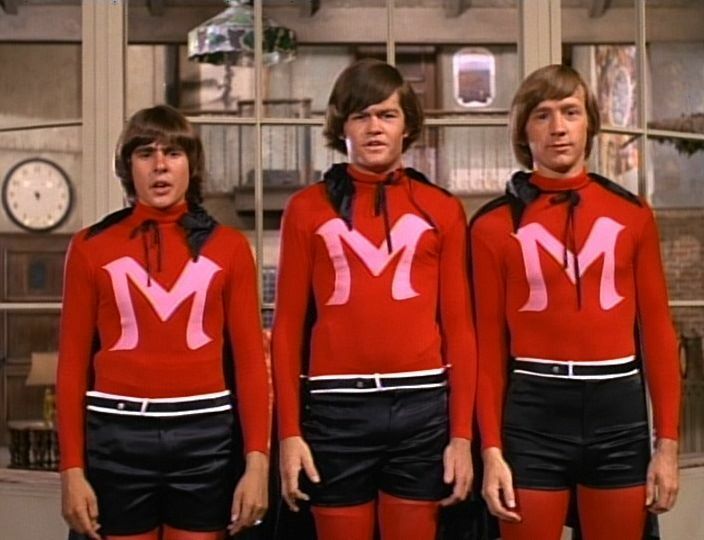 I was curious to see what The Monkees, and their fans, were all about. I got my answer as soon as I walked into L.A.’s sold-out Pantages Theatre. It was like crashing a huge family reunion. There were so many people that already knew each other, whether from various Monkees conventions through the years or through social media. The lobby was filled with folks running around hugging each other and taking pictures. The concert was amazing. I didn't have the best seat in the house as I was way up in the mezzanine. However, I had a great view of the entire audience. The fans were just as entertaining as The Monkees themselves, and their excitement was palpable! Many fans remained standing throughout the entire concert, leaning on the stage, mere inches away from their favorite teen idols. ​I watched as Micky Dolenz leaned down and handed the microphone to one of the fans, letting her finish a verse of "Goin’ Down" for him. Elated, she grabbed her friend in a tight embrace. I looked around and saw the audience filled with couples. Many of them, while hearing their favorite songs, would put their arms around each other and sing. One couple was even dressed as "Monkee Men"! ​There were a lot of songs that got me out of my seat and cheering along with everyone else. The famous standards I was familiar with like "Last Train to Clarksville," "Daydream Believer," and "I'm a Believer," but there were two songs that stood out to me that night that I'd never heard before, and both were sung by Michael Nesmith: "You Just May Be the One" and "Tapioca Tundra," which brought tears to my eyes. Both of these songs, while seeming to highlight the relationship between The Monkees and their fans, spoke to me as well and brought to mind my friendship with The New Monkees. I was so impressed, simply because I could relate to this type of closeness between fan and performer. Some folks were even crying, perhaps realizing that one moment in their lives was over, and now, what was next? I had those feelings, too, after I met The New Monkees, and I believe that planted the seed to start writing about them in 2013. ​And speaking of The New Monkees, there was one New Monkee in the audience that night, Marty Ross. Marty and his wife Doreen had near front row seats, right in the center. He too, wanted to witness the historic moment of Nesmith's last performance with The Monkees. Marty was welcomed with open arms by fans who recognized him. All the negative publicity that The New Monkees had received over the years was not apparent at the Pantages. ​Seeing The Monkees live in Los Angeles this past September was a great night for me. I loved it. The Monkees and their fans are such a neat group of people. And that is coming from a New Monkees fan! I hope all of you who were lucky enough to see The Monkees in concert this year had a great night, too! "You Told Me," "Birth of an Accidental Hipster," and "Sunny Girlfriend" soundchecked in L.A. Whether in the show proper or at soundcheck, "Birth of an Accidental Hipster" is a showstopper! And Peter's banjo is a much welcomed addition. I almost wish it was featured in the studio version. September 16, 2016: Michael Nesmith’s final performance with The Monkees at the Pantages in Los Angeles, California. Megan and Craig review the show and discuss their feelings in the aftermath. A big thanks to Elliott Marx for sharing his recording of The Monkees' performance at the Pantages Theatre in Los Angeles, California! Micky, Michael, and Peter onstage in L.A. Please note that this post is being constantly updated with new video footage. Large portions of last night's concert were streamed live on The Monkees Tour Facebook page, and it is currently archived there. There have been many monumental moments in the 50 year history of The Monkees. Tonight is one of them. At 7:30pm in Los Angeles, Michael Nesmith will walk on to the stage with Micky Dolenz and Peter Tork at the historic, and sold out, Pantages Theatre to perform what he says will be his final concert with The Monkees. Michael revealed his intentions in a Facebook post on August 19. "I expect it will be fun, and a great way for me to sign out," Nez wrote. "I see the specter of the multiple Sinatra retirement/farewells — and this seems like the perfect time for me to step off, sit down and shut up. Hope I see you there...What a long strange trip, it’s been said...and it looks like I’ve made it to the end." Michael's announcement arrived after what to date has been a jam-packed year of festivities celebrating the group's 50th Anniversary. Among them includes The Monkees' first new studio album in 20 years, Good Times!, released in May, which was greeted with rave reviews and a Top 15 placement on the Billboard Top 200 Albums chart, their highest showing since 1968. But when an extensive tour was announced to support the album and celebrate the 50th, Nesmith was absent from the lineup. He explained to fans this past April that a commitment to deliver his upcoming book, Infinite Tuesday: An Autobiographical Riff, prevented him from going on the road. At the same time, he frequently declared his desire to play with Micky and Peter, and made good on that promise at a couple of concerts this summer. On June 1, Michael "appeared" with Micky and Peter in New York City via Skype, performing "Papa Gene's Blues," and later joined the duo during the encore performance in Monterey, California on August 5. Nez unexpectedly returned to the concert stage this week after Peter announced that he would miss two shows in Arizona because of a family emergency while also informing fans that Michael would substitute for him on those stops. Since his departure from The Monkees in early 1970, Michael has often been absent from Monkees activities but always remained publicly supportive of the endeavors of his former bandmates. When 1986 rolled around and Micky, Peter, and Davy Jones reunited for the first time to celebrate the group's 20th Anniversary, Nez was forced to politely decline the invitation to undertake what became a massive, 7 month tour across North America. ​"When the whole thing [the Monkees reunion] first started off, there were 10 or 12 dates and I was on them and looking forward to it," Michael told Goldmine in 1991. "Well, because it was the 20th Anniversary and nobody knew it was going to get as big as it did, it went from 20 dates to 200 in just a matter of weeks." Because Nesmith was producing the film Square Dance at the time, he was ultimately forced to withdraw from the reunion. "I'd planned on being able to tuck and roll the movie in between the [Monkees] dates but the next thing I know it had gone from going out for a few weekends to going out for four months solid. So, the time constraints just conspired against me." Nez instead voiced his support for the rest of the group as well as his desire to play with The Monkees when the moment allowed. "Then, for some reason," he said, "the perception got out that, well, he never did like this whole thing, and the fact of the matter is that Nesmith does just fine with it. I like it a lot, it's perfectly fine." Before the 20th Anniversary Tour commenced, Micky took a moment to reassure fans about Michael's support for the trio's new activities, telling the Philadelphia Daily News that "He's behind us all the way." ​Despite being off the road in 1986 , Michael did attend a Monkees concert in disguise at Arlington Stadium in Texas on June 22. "I thought they did a great job," Nesmith told a Texas newspaper at the time. "As a matter of fact, I called Micky the next day and told him I thought it was sensational." He finally joined Dolenz, Jones, and Tork onstage for the encore performance at the Greek Theatre in Los Angeles, California on September 7. All four Monkees also took part in filming a Christmas medley music video for MTV in early December. The video featured Mike as "Santa Claus" and was in heavy rotation on the cable network during the holiday season. After filming, the quartet hosted a party at a Manhattan nightclub to celebrate the end of a very successful year for The Monkees. Nesmith wouldn't return to the concert stage with The Monkees until 1989 but the occasion was a special one: The Monkees received a star on the Hollywood Walk of Fame that summer, and Nez joined the celebration by playing an extended set with Micky, Davy, and Peter in Los Angeles at the Universal Amphitheatre. ​​Michael's absence from The Monkees' 1980s revival was not without reason. Beginning in the mid-1970s, and after releasing a series of critically acclaimed albums for RCA Records, he had became chief executive of the Pacific Arts Corporation, which developed media projects and produced motion pictures. Time was always a factor for Nesmith, and The Monkees' subsequent worldwide tours throughout 1987-1989 made it impossible for him to commit to such extensive endeavors. As a result, Michael's appearances with The Monkees in the '80s were always widely covered events. Nesmith's next round of Monkees activities wouldn't come until the 1990s when he joined Micky, Davy, and Peter on January 5, 1995 at the Hard Rock Cafe in Hollywood, California. In their first appearance together since 1989, The Monkees gathered to receive platinum and multi-platinum awards for their first five albums, which had recently been re-certified. With a large crowd of media and fans on hand, the quartet announced their commitment to celebrate The Monkees' 30th Anniversary in 1996. ​Despite the excitement that Michael Nesmith would indeed be a full participant in this new round of Monkees projects, fans were disappointed when it was announced in October 1995 that a proposed Monkees reunion tour in 1996 would not include Nesmith as originally planned. When his Pacific Arts Corporation became involved in a lawsuit with television channel PBS, Michael, who at the time was reportedly discussing setlists and staging of the tour, was forced to stay off the road. He did, however, pledge his full support to The Monkees, and promised to be an integral part of the band's 30th Anniversary projects. ​"Well, it's not likely that the four of us would come to terms on this situation, but this is the way I'd want it to happen. I'd have Micky, David and Pete come up here to Carmel and we'd go into the studio and do an album completely on our own, based upon a synthesis of our own musical directions. I'd put the album out on Pacific Arts [Nesmith's production company at the time]. No hype, no full page ads in the trade papers saying 'Monkees comeback album!' or anything like that. I'd just quietly put the album out and let people discover it on its own musical merit. Under those circumstances, yeah, I'd do it." ​In late 1996, Michael explained his return to The Monkees and the eventual recording sessions for Justus. "Coming to terms with the iconography of The Monkees took a long time," he said while speaking with USA Today. "I finally decided there was zero downside." Regarding his absence during previous reunions, Nesmith pointed to his career as a producer and the busy schedule that accompanied it. "The principal reason was allocation of time," Michael told the Chicago Tribune. "I was always doing something else I couldn't get out of. Add to that the fact that I don't like to be out touring for long." But the jam sessions with the group earlier in the year proved infectious. "We finally got into a rehearsal studio and it dawned on us, 'Gee, we could make a record here. This sounds great!'" Justus made its way to music shops in October 1996. In promotion of their new album, The Monkees gathered in Los Angeles, California at Billboard Live to perform a mini-concert arranged for the media and fans lucky enough to attend. The event made entertainment headlines and major features were written about the band in newspapers like USA Today and the Los Angeles Times. TV Guide also previewed The Monkees' new ABC television special and their sold out appearances at Wembley Arena in London, scheduled for March 1997. The appearance at Billboard Live would be the only concert in the United States by all four Monkees to promote Justus, as well as the last performance ever in the United States by the full quartet. The 30th Anniversary reunion of The Monkees experienced turbulence when Michael suddenly departed the group after touring the UK in early 1997 in support of Justus, backing out of the much anticipated American portion of the tour, scheduled for the summer of 1997. Nez had originally committed to a schedule of about 15 to 20 concerts across the United States, with a plan to play large arenas to accommodate demand due to the limited amount of dates. However, shortly after returning from the UK it was announced that Michael would not be touring and instead would devote his time to writing a script for a proposed second Monkees feature film. "The movie is at the top of my list," he explained to Monkee Business Fanzine at the time. "If one of us doesn't stay here and do it, it won't get done, like Justus. I enjoy playing live, but time is time." Monkees fans in the United States, who had waited for a full-scale tour by all four Monkees since the band's reformation in 1986, were dispirited. ​Speculation abounded around Nesmith's departure, ranging from internal tensions among the band to the fact that The Monkees had received less than favorable reviews during their tour of the United Kingdom. "The UK shows were fun enough, Nesmith told Record Collector in August 1997. "It's always fun to play at an arena level. And Monkees fans being what they are, they had a good time. So there wasn't anything unpleasant about that side of it. But on a global level, it's understood that the UK press is the worst in the world. So I knew I was walking into the absolutely worst possible place I could go. Even so, I had forgotten how mean-spirited the press could be. I knew that it was substandard and unintelligent and tied to what advertisers want, but I didn't realize it was mean-spirited. And that was devastating, to see that operating as the voice of the public. It put me right off. I walked right into that and thought, 'My God, this is a terrible thing to be involved in.'" Years later in 2013, Michael spoke about the band's dissolution in the early months of 1997. "It was just a divergence of paths more than anything else," he told Rolling Stone. "Micky, Peter, and Davy just had their sails blowing in different ways than me." After recording Justus and promoting it via live performanes in Los Angeles and the United Kingdom, along with writing and directing the group's 1997 TV special, things remained extremely quiet on the Monkees front for Michael Nesmith in the subsequent years. Another monumental moment in Monkees history, the passing of Davy Jones on February 29, 2012, changed everything. Without Davy, most fans believed it was the end of The Monkees as a group. “There is a faint chance we'll continue,” Peter told Rolling Stone. “I don't know whether we could structure something without Davy. I had a couple of thoughts, but I don't know if they're workable.” However, on August 7, 2012, Nez posted a message on Facebook that read “We may be coming to your town.” That same day, The Monkees’ Facebook page alerted fans about a special announcement for August 8. In a move that surprised many, a 12-city tour of the United States was announced for November and December, featuring the surviving members of The Monkees. The tour eventually visited theatres around the country, highlighted by stops in Los Angeles at the Greek Theatre and the Chicago Theatre in Illinois, and closing on Broadway in New York City at the Beacon Theatre. Reviews were overwhelmingly positive. The Chicago Tribune said the concert at the Chicago Theatre "was an emotionally disarming multimedia show that, for all its backward glance, felt fresh and electric." Ticket sales were swift, too. "When we called to get ticket counts on the first day sales for the November tour, we were taken aback by how quick the East Coast dates were selling out," Bruce Solar of The Agency Group told the Hollywood Reporter. "By the middle of the first day, we had promoters calling us trying to add more nights." Nez continued to perform with The Monkees throughout 2013 and 2014, and, of course, later joined both Micky and Peter this year to record Good Times!, the group's first album of new material since Justus. When being interviewed by the Boston Globe in 2013, Michael waxed philosophically about The Monkees, its fanbase, and playing for their audience so many years after their original heyday. "Part of the fun of growing up is not having to act any certain way - and Monkees fans always traveled their own path," Michael said. "They stayed fans while their contemporaries ridiculed them and they are still fans. So to play live for the codger boppers while the new fans discover the music and silliness and share it is a lot of genuine fun - and that’s hard to come by." And now here we are in the fall of 2016, 50 years after the debut of The Monkees on NBC on September 12, 1966. "What a long strange trip, it’s been said...and it looks like I’ve made it to the end," as Nez wrote on Facebook last month. ​But is it truly the end? Perhaps Michael's days as a Monkee on the concert stage have concluded, but will he be willing to participate in other Monkees activities in the future? Only time will tell. A long, strange trip indeed.